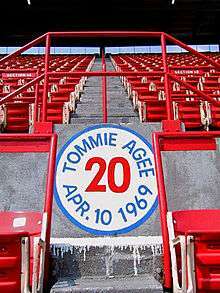 Tommie Lee Agee (August 9, 1942 – January 22, 2001) was a Major League Baseball center fielder. He is noted for making two of the greatest catches in World Series history, both of which took place in game three of the 1969 World Series. Agee was born in Magnolia, Alabama, and played baseball and football at Mobile County Training School with future New York Mets teammate Cleon Jones. After one season at Grambling State University (1961), Agee signed with the Cleveland Indians for a $60,000 bonus. After two seasons in the Indians' farm system with the AAA Portland Beavers, Agee received a September call-up to Cleveland in 1962. With the Indians already behind 11-1 to the Minnesota Twins, Agee made his major league debut on September 14 at Metropolitan Stadium pinch-hitting for pitcher Bill Dailey in the ninth inning. He received September call-ups to the majors the following two seasons as well, playing a total of 31 games with the Indians in which he batted .170 with one home run and five runs batted in. Following the 1964 season, he was dealt to the Chicago White Sox with Tommy John as part of a three team blockbuster trade between the Indians, ChiSox and Kansas City Athletics that returned All-Star Rocky Colavito to the Indians. Agee batted just .226 with the Pacific Coast League's Indianapolis Indians, and .158 in ten games with the White Sox in 1965. After earning the starting center fielder job in Spring training 1966, he hit a two-run home run in the season opener, and was batting .264 with nine home runs and 38 RBIs to be named the White Sox's sole representative at the 1966 Major League Baseball All-Star Game. He ended the season with a .273 batting average, 22 home runs and 86 RBIs to earn American League Rookie of the Year honors, while his defense in center field earned him a Gold Glove. Although he was technically in his 5th major league season, MLB's classification of a rookie is determined by plate appearances and time on a major league roster. Agee's September call-ups had been so brief and his playing time so scarce that he was still eligible for the award. The spot where Agee's home run landed at Shea Stadium. The marker was removed during the demolition of Shea Stadium and was sold to a private collector, who has it on display in his backyard. Agee was beaned by Bob Gibson on the very first pitch thrown to a Mets batter in spring training 1968. At the beginning of the regular season, he went 0 for 10 in a 24-inning affair with the Houston Astros that saw his batting average go from .313 to .192. It led to an 0 for 34 slump that brought his average down to .102. For the season, he batted .217 with five home runs and 17 RBIs. Agee got off to a hot start in 1969. He enjoyed his first career multi-home run game in the third game of the season, against the Montreal Expos, one of which went halfway up in section 48 of the left field upper deck at Shea Stadium, a feat that was never matched. Expos right fielder Mack Jones says the ball was still rising when it came into contact with the stands. To commemorate the homer, there was a painted sign in that section of the stadium with Agee's name, uniform number, and the date. He also had his first four hit game on May 2 (4 for 4 with a walk and a home run). By May 21, Agee was batting over .300, and the Mets won their third game in a row for a .500 winning percentage 36 games into the season for the first time in franchise history. This was followed by a five- game-losing streak that saw the Mets fall into fourth place in the newly aligned National League East. The Mets then went on an eleven-game-winning streak that included a two-home run, four-hit performance by Agee against the San Francisco Giants in the final game of the streak. By this point, the Mets were in second place, seven games back of the Chicago Cubs. The Mets were two and a-half games back on September 8 when the Cubs came to Shea to open a crucial two game series with the Mets. Cubs starter Bill Hands knocked down the first batter he faced, Agee, who had been moved into the lead-off spot in the line-up, in the bottom half of the first inning. Jerry Koosman hit the next Cubs batter he faced, Ron Santo, in the hand, breaking it. Agee himself retaliated by hitting a two-run home run in the third, and scored the winning run of the game on a Wayne Garrett single in the sixth inning. The Mets swept the Expos in a double header on September 10. Coupled with a Cubs loss, the Mets moved into first place for the first time ever during the 1969 season. The Mets would not relinquish their lead from this point. On September 24, the New York Mets clinched the NL East as Donn Clendenon hit two home runs in a 6-0 Mets win over Steve Carlton and the St. Louis Cardinals (who struck out a record nineteen Mets nine days earlier in a losing effort). For the season, Agee batted .271 while leading his team with 26 home runs, 97 runs scored and 76 RBIs. Along with Cy Young Award winner Tom Seaver and Cleon Jones, he was one of three Mets to finish in the top ten in NL MVP balloting, and was named the Sporting News' NL Comeback Player of the Year. Agee batted .357 with two home runs and four RBIs in the Mets' three game sweep of the Atlanta Braves in the 1969 National League Championship Series. The Mets were heavy underdogs heading into the World Series against the Baltimore Orioles. In Game 3, with the series tied 1-1, Agee had what Sports Illustrated called the greatest single performance by a center fielder in World Series history. In the first inning, Agee hit a leadoff home run off Jim Palmer for what would eventually be the game-winning hit and RBI, as the Mets shut out the Orioles, 5-0. In the same game, Agee also made two catches that potentially saved five runs. Agee began the 1970 season by going on a twenty-game hitting streak from April 16 to May 9. He enjoyed one of the finest games of his career on June 12, when he went four for five with two home runs and four runs scored, and he would go on to be named NL Player of the Month for June with a .364 batting average, 11 homeruns, and 30 RBI. He also hit for the cycle on July 6. Agee displayed his spectacular and daring base running in the 10th inning in the NY Mets 2-1 win over the LA Dodgers when he stole second, took third on a wild pitch and surprised every one when he stole home for the victory! For the season, Agee batted .286, and established a Mets season record for hits with 182, runs with 107, and stolen bases with 31. He also won his second Gold Glove award, making him the first African-American to win a Gold Glove in both leagues. After retirement, he operated the Outfielder's Lounge near Shea Stadium. Agee was also known as the most active former Met, taking part in many charitable events and children's baseball clinics around both the New York area and Mobile. He appeared as himself in a 1999 episode of Everybody Loves Raymond along with several other members of the 1969 Mets. Agee suffered a heart attack while leaving a Midtown Manhattan office building on January 22, 2001, and died later that day at Bellevue Hospital Center, aged 58. He is survived by his wife, Maxine, and a daughter, J'nelle. Agee was buried in Pine Crest Cemetery in Mobile, Alabama. He was posthumously inducted into the New York Mets Hall of Fame in 2002. ↑ "Minnesota Twins 11, Cleveland Indians 1". Baseball-Reference.com. 1962-09-14. ↑ "Chicago White Sox 3, California Angels 2". Baseball-Reference.com. 1966-04-12. ↑ "1966 All-Star Game". Baseball-Reference.com. 1966-07-12. ↑ "Tommie Agee". Ultimate Mets Database. Retrieved 2009-01-02. ↑ "Houston Astros 1, New York Mets 0". Baseball-Reference.com. 1968-04-15. ↑ "New York Mets 4, Montreal Expos 2". Baseball-Reference.com. 1969-04-10. ↑ "Chicago Cubs 6, New York Mets 4". Baseball-Reference.com. 1969-05-02. ↑ "New York Mets 9, San Francisco Giants 4". Baseball-Reference.com. 1969-06-10. ↑ "New York Mets 3, Chicago Cubs 2". Baseball-Reference.com. 1969-09-08. ↑ "Agee steals the show in four-hit shutout by Gentry & Ryan". 1969-10-14. ↑ "1969 World Series, Game 3". mlb.com. Retrieved January 20, 2015. ↑ "New York Mets 6, Atlanta Braves 1". Baseball-Reference.com. 1970-06-12. ↑ "New York Mets 10, St. Louis Cardinals 3". Baseball-Reference.com. 1970-07-06. ↑ "Tommy Agee Steals Home in the 10th Inning". ↑ "Houston Astros 4, New York Mets 2". Baseball-Reference.com. 1973-04-24. ↑ "Big Shots". Everybody Loves Raymond. 1999-03-01. ↑ Goldstein, Richard (2001-01-23). "Tommie Agee, of Miracle Mets, Dies at 58". New York Times. Retrieved 2010-05-25.